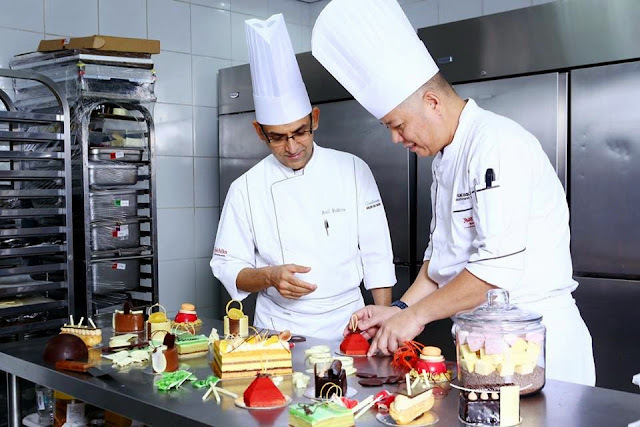 Marriott Hotel Manila is throwing a Valentine experience like no other. Each of the hotel’s restaurants will feature famous elements from the worldwide phenomenon “Fifty Shades of Grey”. Hold nothing back and be seduced by luscious treats you would never, ever want to miss. Experience a palm-twitching romance at Marriott Café. Excite your senses as you enter the “Red Room” filled with sinful and sensual desserts. Have a bite of steamy culinary selections that are mentioned in the trilogy such as oyster, strawberry, cheese, smoked salmon, vanilla ice cream and more surprises. Get into the romantic mood and treat your loved one to a dinner buffet (P 2,650) or to a Sunday brunch (P 2,600) from February 13-15, 2015,. 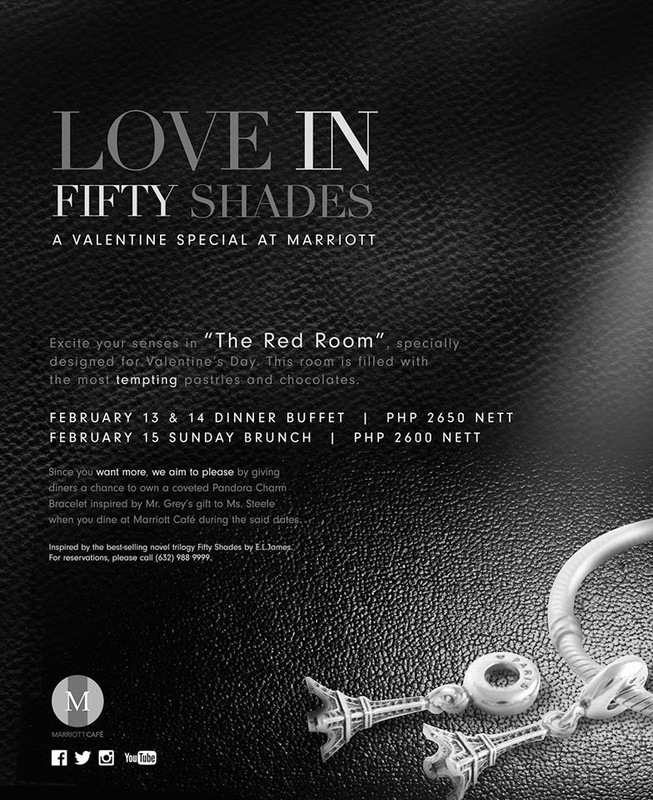 To recreate one of the sweetest moments from the novel, Marriott Cafe gives diners a chance to own the highly coveted Pandora charm bracelet, just like Mr. Grey’s surprise birthday gift to Ms. Steele. Temptation never tasted so good at Cru Steakhouse. For starters, Executive Chef Meik Brammer recreated an iconic dish from one of the couple’s dates - the Charity Ball. Ignite your taste buds with the Salmon Tartare with Crème Fraiche and Cucumber on Toasted Brioche. Submit to your inner sweet cravings with “The “Dom”, a special course that embodies the character of Mr. Grey, tough on the outside but delicate on the inside. This chocolate dome melts under a lovely chocolate sauce revealing a mouthwatering dessert composing of hazelnut cake, truffle gianduja and chocolate sorbet. Naughty but sweet creations takes over the hotel’s gourmet coffee shop. 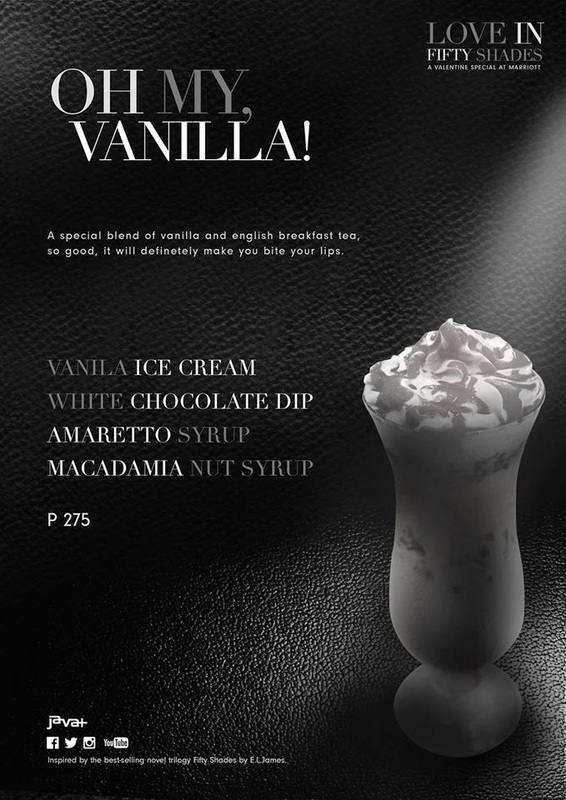 Java+ focuses on Ana Steele’s obsession with Christian Grey represented in “Sweet 50 cupcakes” paired with a milk tea concoction called “Oh My, Vanilla”, a special blend made from English Breakfast Tea and Vanilla, a concoction that best describes Ana’s demure personality. The Greatroom teases you with a seductive, handcrafted cocktails named after the famous lines from the novel such as Pinch of Pleasure, Punish Me and Cuff Love. Sway those hips with the sultry music from a live piano performance from the book’s playlist. On a lighter note, ladies are invited to unleash their inner Goddess with “Steal Steele’s Cup” a custom blend of English Breakfast Tea featured in the Greatroom’s afternoon high tea, complemented with elegant pastries consisting of sweet, scones and savory for only P550 available from 2-5 pm. Let your own Mr. Grey fuel your romance at Marriott Manila. Call (02)9889999 or visit manilamarriott.com for reservations. Will there be "devices" in the Red Room? Hahaha! Joke lang. Nice theme for V-Day.